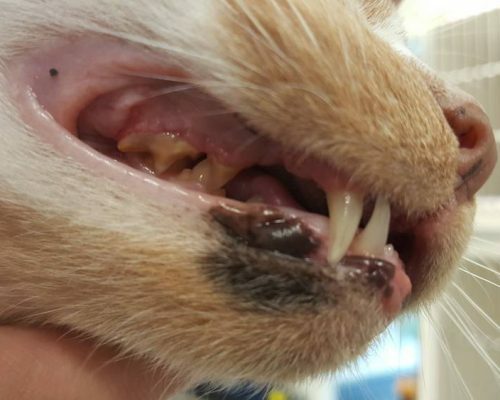 Dental disease is the most common health issue in pets with up to 85% of cats and dogs over 3 years of age affected. We are often asked why because most people think it never used to happen. There are many reasons for this including increased life expectancy, the shift in popular breeds (small breeds with crowded teeth are predisposed to dental trouble) and diet but the underlying truth is that in times past pets did have dental problems, they just were not recognised and in many cases the teeth were so rotten they simply fell out. As with human teeth, residual food, bacteria and calcium deposits form plaque and tartar on pets teeth. If left unchecked this leads to periodontal disease and in addition to potential tooth loss this painful condition will result in increased numbers of bacteria entering the bloodstream with potentially life threatening consequences. The good news is that dental disease is preventable and in addition to a professional scale and polish by your veterinarian dental health can be maintained by a combination of dietary control and dental hygiene. The more your pets chews the better. Aids include dental treats and chews, dental diets and fresh, raw bones. Dental hygiene can be maintained by regular (daily) teeth brushing with a pet toothpaste, rinsing with special gels or using dental water additives.